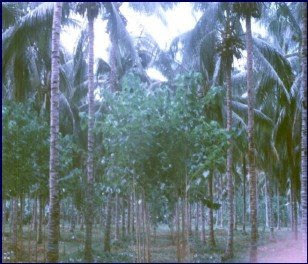 The coconut – based agroforestry system involving coconut + gmelina (Gmelina arborea Roxb.) interplanting under leaf pruned coconut is a scheme to save the coconut industry from being a sunset industry by providing a practical substitute to the cutting of coconut trees. Gmelina arborea is a fast growing forest tree planted to produce wood for light construction, crafts, decorated veneers, pulp, fuel/charcoal, furnitures etc. Coconut leaf pruning (CLP) involves the removal or pruning of coconut leaves to allow adequate sunlight for normal development and high yield of perennial and annual coconut intercrops. 1. The existing bearing coconut are pruned from leaf 23 (with the oldest harvestable bunch and below, maintaining 22 living leaf fronds every nut harvest. 3. Pruned the lateral branches of 1-3 years old gmelina trees below 3 m height to promote straight and bigger trunks. 4. Harvest 25% of the total gmelina planting at the 3rd year for banana props, fuel; another 25% on the 6th year and the remaining 50% on the 10th year for lumber (wood) and fuel purposes. Improved vegetative (more pruned branches and bigger trunks) and yield (lumber) could be produced from gmelina planted under leaf pruned bearing tall coconuts. Gmelina provides for other beneficial uses such as fodder (leaves) for animals, silkworms; as folk medicine (root and bark decoction) good for abdominal tumor, blood disorder, diabetes, fever, etc. and its flowers produced good quality honey. Leaf fronds pruned from coconuts can be used as raw materials in handicraft cottage industry products such as baskets, seat cover, brooms and as fuel/charcoal. Increased net farm income from gmelina products (as lumber, construction materials, carvings, furnitures) and its by-products (branches as fuel). Intercropping gmelina under tall bearing coconuts prevents the cutting of coconut trees for lumber/timber purposes. On water – depleting capacity – Gmelina thru thick litter it forms at its base, increases the water –absorbing and water-holding capacity of the soil. There was no difference in soil moisture content on areas near gmelina and near coconut trees. On soil acidity – Soil pH at plots with and without gmelina showed statistically the same level of pH indicating that gmelina does not cause acidity of the soil. On allelophatic effect – no harmful or inhibiting effect on the growth of another plant, i.e. coconut was observed. On depletion of organic matter – There was an increase in organic matter content in plots planted to gmelina possibly due to the accumulation of shedded leaves of gmelina on the soil, thus adding to the organic matter content of the soil.